This module has the same spec as for the Synthi AKS Poly MIDI-CV unit, but built into an Afrormosia hardwood case and designed specially for the VCS3 (Mk1) 'Putney' and DK1/2 keyboard controller in mind. It is based around Marc Bareille’s fantastic multi-channel PIC microcontroller based MIDI-CV converter called the ‘MCV876’. The MVC876 comes in three or four channel hardware versions and a clever intelligent ‘MIDI Learn’ feature (see Marc’s website). 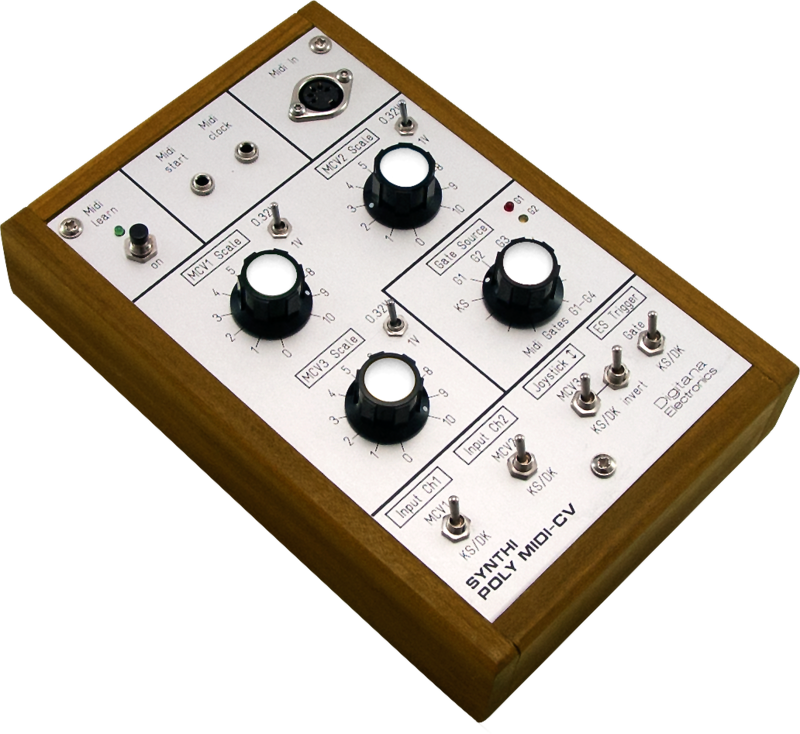 The Synthi VCS3 (Mk1) Poly MIDI-CV uses the three channel unit. The units come with the latest firmware programmed into the onboard microcontroller (PIC182320). The units supports both mono and polyphonic play modes. Marc has created a simple Windows software interface that allows the MIDI-CV (either three or four channel versions) to be configured in different ways to offer different functionalities, all via MIDI SysEx. Control voltages CV1 to CV3 is relevant for the Synthi Poly MIDI-CV. CV1 to CV4 are available for the four channel Synthi VCS3 Quad MIDI-CV Interface seen elsewhere on this website. The unit has Envelope Shaper (ES) trigger assignable to either DK1/2 trigger or any of the four gates (Gate1 to Gate4) via a front panel rotary switch. How many of the four gates are available depends on the mode used. For example, in Poly2 mode, only two gates are available (Gate1 and Gate2). In Poly4 mode or Controller mode all four gates are available to trigger the ES. Gates5 and Gate6 outputs are via 6.35mm jack sockets and offer MIDI start/stop and MIDI clock signals for interfacing/synchronising with other external MIDI devices. There are three front panel level pots for CV1 to CV3. Also there are three toggle switches that can flip the scaling between 0.32V/octave (standard Synthi oscillator scaling) or 1V/octave when pots are set to max level (10). The 1V/octave option is useful if a CV channel is being used as a modulation source rather than give pitch control of a Synthi oscillator. Lower toggle switches allow independent switching of DK1/2 control or MIDI-CV control of each of the two independent CV input channels of the VCS3 (Mk1) matrix (Input Ch 1 and Input Ch 2). A third CV (CV3) is made available via a special cable with EMS patch pin on the end, which can be inserted in any column of the matrix. These switches allow many creative new ways of controlling the VCS3 (Mk1) through a mixture of DK1/2 and/or MIDI control. As an example, one can use the internal oscillator available on the DK1/2 via Input Ch 1 to generate notes and at the same time MIDI generated pitch sequences via CV2 and CV3 controlling osc1/osc2 in Poly2 mode and gate controlled either via the DK1/2 or MIDI Gates1 to 4. There is also the option to invert CV3 via another toggle switch... again adding to the creative possibilities. The unit connects to the VCS3 (Mk1) and DK1/2 by two 8-way cables that have male/female jones plugs on each end. The unit derives a small amount of its power from VCS3 (Mk1) (just a few milliamps for the voltage inverter and transistor buffering of MIDI gates) with the main power coming from the use of an external 12V AC/DC adapter. This is important because the VCS3 (Mk1) has a rather weak internal PSU and so whilst it could very likely power the Poly-MIDI unit without problem (it only draws about 100 milliamps max) it's a better solution to use an external PSU.